The Benzie County profile gives an overview of what life is like in this county, and how you and your lifestyle can fit in. The 25 miles of Lake Michigan shoreline on Benzie County’s western edge is Michigan’s own gold coast: a vacationland studded with pretty port towns, gorgeous parks and sugar-sand beaches. Travel inland, and that dramatic Great Lakes beauty shifts to the quieter charm of the Northwoods: glacier-carved hills, hamlets, farmland, miles of sparkling rivers and 57 inland lakes. A vast stretch of Benzie is preserved in a national park, the Sleeping Bear Dunes National Lakeshore —the highest honor our nation bestows on an area of natural beauty. At 316 square miles, Benzie is Michigan’s smallest county. Its population of about 17,000 swells to nearly 43,000 during the summer months, when vacationers and second-home owners come here live the dream life. But what locals know is that when autumn rolls around and the last beachfront cottages are shuttered for the winter, this four-season paradise continues to inspire. People live here because they love the laid-back lifestyle and the love the outdoors — and with eight golf courses, gorgeous fall color, rich opportunities for hiking, biking, snowshoeing and cross-country skiing, and 135 miles of groomed snowmobile trails, there’s always something to do. Never being more than 45 minutes away from all the amenities in Traverse City is an added bonus. The largest community in Benzie is Frankfort, a laid-back port town with about 1,200 year-round residents. 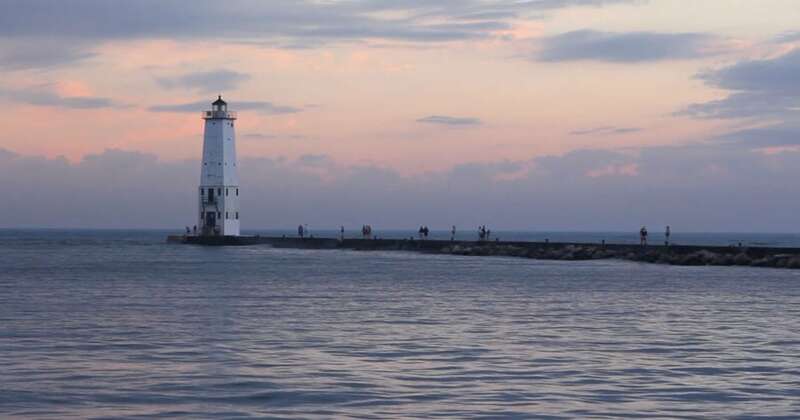 The city sits at the mouth of the Betsie River where it flows into Lake Michigan from Betsie Bay, giving residents front-row seats to show-stopping sunsets plus easy access to the water for boating, fishing and paddling. Downtown you’ll find a dynamic mix of restaurants, retail shops, galleries, and other independent businesses. Certain institutions have become integral to the community, like the Garden Theater, a renovated historic cinema that hosts an annual film festival and shows first-run, independent, foreign and classic movies all year long, and the Oliver Art Center, which offers classes, workshops and innovative programming for all ages. Frankfort also is home to amenities like Paul Oliver Memorial Hospital and Frankfort Dow Memorial Field airport. Charter fishing for salmon and lake trout in Frankfort. Benzie’s villages each has its own unique personality, history and beauty, and range in population size from about 200 to 450 year-round residents. Elberta is Frankfort’s southern neighbor across Betsie Bay; the artsy village is located on a little peninsula wedged between the bay and Lake Michigan. County seat Beulah sits on the south end of Crystal Lake; Cold Creek winds through it and empties into the lake right next to the big in-town beach. Just to the south of Beulah is Benzonia, a quiet village where the Benzie Area Symphony Orchestra practices at the high school, and the you can catch the Benzie County Players, a community theater group, at the historic Mills Community House. Thompsonville is known to many as the home of Crystal Mountain, one of the Midwest’s best ski resorts and a four-season destination for golf, mountain biking, spa services and more. Honor is situated on the Platte River and is revered as the birthplace of Michigan’s salmon fishing industry. Lake Ann is a small community on the north end of a pretty lake by the same name, and at just 25 minutes from downtown Traverse City, is close enough for an easy commute for those who work in town. Wherever one lives in Benzie, there are great options for education. The county is home to two highly regarded school districts, Frankfort-Elberta and Benzie Central. Both districts have small class sizes, which afford more individual attention for each student. But because Benzie’s schools are also part of the Traverse Bay Area Intermediate School District, they are able to offer a wide range of resources from an extensive network of professionals and programs, such as speech and hearing specialists, reading specialists, school psychologists and social workers. Students can also access courses at the ISD’s Traverse City–based Career-Tech Center, a secondary career and technical education facility offering occupational training programs. Historically, Benzie County’s cornerstone industries have been tourism and farming, and that is still true today — though in recent years, other industries like fruit processing, value-added agriculture, healthcare and manufacturing have been on the rise. Some of the key employers in the county include Crystal Mountain resort; agricultural businesses such as Smeltzer Orchard Co., Graceland Fruit, Inc., and BioTech Agronomics; healthcare enterprises like Paul Oliver Hospital and The Maples nursing facility. Of course, tourism-related industries like retail, restaurants and recreation are always a strong part of the economic picture here, too. Area business leaders cite Benzie’s size as being a boon to business here: the tight-knit community makes it easy to build connections and create lasting relationships. Residents are passionate about supporting local enterprises. More than a third of Benzie County is publicly owned land, so residents are never far from a park, forest, beach or body of water that’s there for recreation. Hiking, hunting, fishing, paddling, cycling, skiing, boating and other outdoor adventures are part of everyday life. Even for those who aren’t out on the trails every day, just the presence of these unspoiled places provides a backdrop of beauty and peace, and is why Benzie residents say they’re lucky to live here.